Our AT&T bill was $251 in January. Rachel and I are on the 900 minute, unlimited text, and no data plan - which is usually $100 or so. We went way over our minutes and we paid dearly for it. 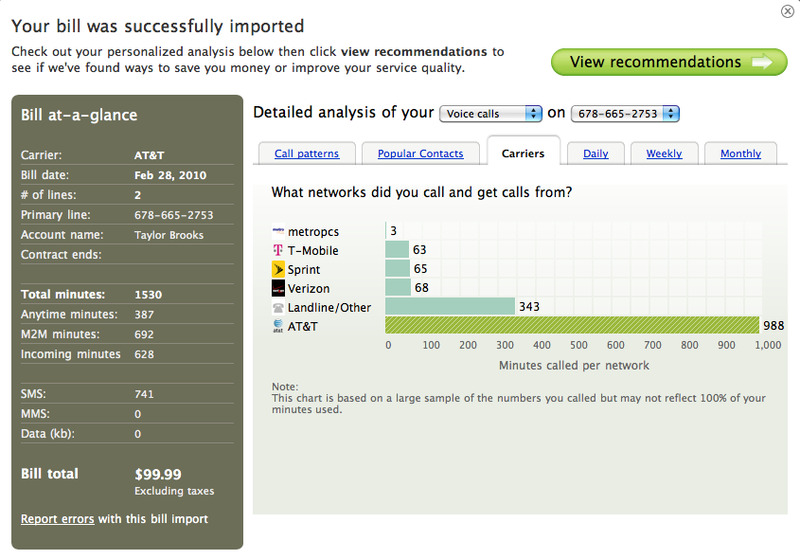 I called AT&T to ask for relief from overages and they weren't so gracious - which led me to looking to other carriers. I turned to BillShrink to help me decide which carrier was best. And the fact of the matter is, AT&T has me in a headlock. The above picture is our bill from February. Notice how many minutes are between me and other AT&T customers! Can you guess why? These minutes are covered under mobile-to-mobile so I essentially don't pay for them. Anyway, it doesn't make any sense for me to move to another carrier. If I do, I'll either a. have to move up to a higher minute tier, that will cost more money or b. stay on a 900 minute or so plan, and pay overages because my AT&T calls aren't covered under mobile-to-mobile anymore. Check out BillShrink for yourself and see if your bill looks anything like mine. I would venture and say that AT&T tops out on everyone's to/from call list.